What's the story behind your book? When did you decide to write it? Like Snyder's 68-year-old narrator in "Hay for the Horses," I never really set out "to do this all my life." The thought of a book grew slowly out of the 25+ years of research and writing that went into it. It seems to have inveigled itself into the month-by-month, year-by-year passage of most of my adult life, but in truth I didn't actually conceive of it as a "book" about Mountains and Rivers Without End until the early 1990s. So how did you grow into it? Well, to start at the beginning…. I like to think that the processes that produced my book ran parallel to those captured by Jack Kerouac in On the Road. Certainly a journey involving discovery was at the heart of things. I was an "Easterner," a city kid, born in Philadelphia just before W.W.II. I didn't break away from that urban mold until I graduated from St. Joseph's University in the early 60s. Faced with selling insurance for a living, I applied to, and was accepted at, several graduate schools. Given the choice, I decided to attend the far away University of Hawaii over the more conveniently located and far less exotic Johns Hopkins in nearby Baltimore. After a couple of years in the islands, working toward an MA degree, I continued the journey with a two year stint as an English teacher in the Peace Corps (Nigeria 1963-65) during which time I met and married a fellow volunteer, Susan Conway, also a city person (Chicago). At the end of our Peace Corps service we relocated in New Mexico to continue with graduate studies primarily because the landscape was totally different from the urban places we came from. Leaving Nigeria, we returned to a changed world, clearly more than just a shift in landscapes. During our time in West Africa "The Kingston Trio" had given way to "The Beatles," the Vietnam War had blossomed into deadliness, and the Civil Rights movement had became rightfully strident. The untested, more or less innocent, perspective on American life and culture that we went away with had undergone a serious mutation in West Africa and our upcoming time among the red rock canyons, mesas, and Native American influences of the American southwest would become a living context for a major shift in the way we would live our lives. During this moment in time, the poetry of Gary Snyder first crept into my life. Was Snyder the focus of your studies in New Mexico? No, not in any direct way. I had cut my scholarly teeth, so to speak, on Brooks and Warren's Understanding Poetry and New Criticism (although it wasn't a big deal to label it so at the time). My earlier undergraduate and graduate studies had steeped me in the work of the traditional moderns—Joyce, Eliot, Pound, Gertrude Stein, Hemingway, Faulkner, Steinbeck, Frost, Stevens, William Carlos Williams, Dylan Thomas, and so forth—but the truth is that I knew practically nothing about writers like Kerouac, Ginsberg, Whalen, Snyder, Levertov, Olson, Creeley (among others). My first contact with the name "Gary Snyder" came in Gene Frumkin's graduate course in Contemporary (mid-60s) American Literature which I took as an elective course. We read extensively in Donald Allen's seminal anthology The New American Poetry (Grove Press 1960). I didn't like everything I read, but Snyder's poetry, with its emphases on subjects like the natural world, social responsibility, Japanese Zen, and Native America, was a standout. Even better, UNM was the locus for public poetry readings and we were treated to a series of performances, including one by Snyder himself. When I first heard his rich voice, and felt his actual poetic presence, it was literally enchanting. Still, as much as I was intrigued by his poetry and presence, Snyder was only a peripheral interest. My actual research area was modern drama and I was diligently researching a dissertation topic on the work of Harold Pinter. It was also time to get a real job. Teaching assistantships and graduate school don't go on forever. Harold Pinter? Gary Snyder? That's a leap. What's the connection, if any? There certainly wasn't any link on the surface but, looking back on it now, I think more than one existed. At some level I've always enjoyed musing on the relationship between poetry and drama; that interest was surely at work when I decided to focus on "The Poetic World of Harold Pinter" for my dissertation. At St. Joseph's I had been introduced to the subtleties of Shakespeare's poetry and drama by Frank Olley, a superb teacher who also directed plays for the university's drama society, The Cap and Bells. Although I didn't have a lot of time for extracurricular activities, I found time to be a member of The Cap and Bells for four years. Each year Prof. Olley directed two plays, one modern and one "classical" (usually Shakespearean). I had bit parts in them or served on the production crew and loved it all. So perhaps it's no surprise that years later, at UNM, I chose Franklin Dickey, a specialist in both Renaissance drama and the "New" British Drama (i.e. John Osborne, Harold Pinter, etc. ), to be my dissertation director. As curious as I was about the poetic drama of Shakespeare, I remember studying his plays alongside modern poetic dramas written by playwrights like Archibald MacLeish (JB) and Christopher Fry (The Lady's Not for Burning). I knew T. S. Eliot's plays (The Cocktail Party, Murder in the Cathedral, etc.) as well as his long poems The Wasteland and Four Quartets and I studied his essays that often commented on the relationship of drama and poetry. Having touched on Japanese theater when I was at the Univ. of Hawaii, I admired W. B. Yeats's attempt to write highly poeticized English language Nô plays. The other side of this coin, obviously, is to see the dramatic in the poetic, something I recognized early on in Snyder's Mountains and Rivers Without End which, from its inception, was meant to be, as Snyder has mentioned in several places, a performance. Readers of the poem-in-a-book may forget that the aesthetic of the Japanese Nô drama is one of the structural mainstays of Snyder's poem. More than that, the word "performance" should conjure up its wider sense as well as that narrow application. Other performance models from Southeast Asian culture and Native American storytelling are also at work in his poem. The best "readings" of the poem will envision Mountains and Rivers Without End as a dramatic piece. So the Pinter connection just comes down to your interest in the relationship of poetry and drama? That's not the whole story. I never actually completed that dissertation on Pinter's "poetic world"; many months into my research I woke up one morning to find that another graduate student (I think at Wisconsin) had just finished a dissertation on that very topic. So ... "The Poetic World of Harold Pinter" was no longer a possibility. Not the happiest day of your life, I'm sure. Certainly not. It took me several months to recover, but it forced me to refocus my thinking in a way that had a lot to do with my interests in literary structure. I wasn't going to throw away all the time I'd spent researching Pinter so I needed a way to keep his work at the center of a new dissertation topic. While I was thinking about things I reread my Master's thesis, essentially an analysis of Muriel Spark's The Prime of Miss Jean Brodie. Perhaps because I seem to have had an abiding passion for understanding structures—my first year and a half at St. Joseph's was in an engineering program studying Electronic Physics—my MA thesis contained pseudo-scientific diagrams and timelines as aids to unravel the complicated structure of Spark's novel. Since "Theater of the Absurd" playwrights like Pinter, Beckett, and Ionesco were challenging the very idea of "meaning," I started to look at Pinter's work in a similar light. If one dispenses with "what does it mean?" as a primary question, what new area of questioning rises to the surface? Structural considerations, of course: not what something means, but how it is put together becomes a primary line of inquiry. I wasn't alone in this perception. Even the old "New Critics" had discussed juxtaposition as a poetic effect, and numerous contemporary critics, in various scholarly fields, were in the process of shaping the ideas and methods that would eventuate as "structuralism." Anyway, while I was stewing about how to refocus my dissertation on the structure of Pinter's plays, my wife was hard at work on a Master's degree in Guidance and Counseling. She came home one night to tell me about something called the Flanders method, used in educational circles to analyze interaction in the classroom. It wasn't long before I was immersed in the field of Social Psychology and Small Group Interaction where I read about the work of Robert Bales and a method he called "Interaction Process Analysis." It was a little dry for literary use, but Bales' method for seeing interaction as a blending of "social-emotional" elements and "task" elements seemed to be the perfect way to capture what went on during the give and take of a Pinter play. Franklin Dickey gave me the okay and the only thing missing, but not for long, was the computer programmer I eventually found who helped me to collect and sort data on IBM punch cards. Eventually I broke down Pinter's The Homecoming into 1029 "speech acts," sorted them all out in various ways, compiled tables of data, produced diagrams, and then, and only then, drew conclusions about the way Pinter had put his play together. As a young graduate student I had hopes that my method for analyzing the miniscule interaction of characters would one day become a valuable critical tool for establishing a "play-print" of selected works of modern drama. Alas, it was just a dissertation. Still, the experience clearly taught me how to interweave microcosm—the little bits and pieces—and macrocosm—the way they all fit together—into a whole, a procedure which plainly would connect later on with my approach to Gary Snyder's Mountains and Rivers Without End. Okay, we can come back to that later; where did you wind up after New Mexico and how did your connection to Snyder's poetry deepen? I took a position at Colby College in Waterville, Maine (the journey toward a new landscape once more). I was hired to teach Freshman Composition and the occasional Introduction to American Literature survey, but a sudden shift in personnel put me in charge of teaching the department's course in Modern Poetry (rather than Modern Drama), which included a small budget for occasionally bringing poets to campus. When Snyder accepted an invitation to read on campus our lives drew closer once more, if only temporarily. He stayed in our home during his three-day visit at the college. He gave a well received performance for the college community one evening and lectured to several classes. For one class he presented his English language version of a Japanese Nô play called Yamamba, but I wasn't actively pursuing any thoughts about Mountains and Rivers Without End so I never made the connection. This play, of course, is crucial to an understanding of his long poem besides serving as the structural substratum for its climactic section "The Mountain Spirit." At home, after dinner one evening, we spoke briefly about writing poetry but after the three days were up we went our separate ways. There were miles to go before I would "choose" Snyder's Mountains and Rivers Without End as my special project. The truth is that I still hadn't finished my dissertation on Pinter. When I did I was promoted to Assistant Professor, but, not being on a tenure track, my appointment at Colby ran out. In 1972 my wife and I (now with two small children) returned to Puerto Rico where we had first met during training for our Peace Corps service and I took a job at the University of Puerto Rico at Mayaguez. Little did I know that I would spend the rest of my professional life in this out of the way city on the western edge of a Caribbean island. Is this where Mountains and Rivers Without End comes in? Yes. By this time, poetry, including the poets of mid-century and later, had become something of a specialty for me. Picking up on my interest in Snyder's work, I published a short short article on his lyric poem "After Work" in The Explicator. In 1978 I was among those chosen to attend a National Endowment for the Humanities (NEH) Summer Seminar program at the University of California, San Diego, under the direction of Roy Harvey Pearce. The seminar topic was the "Long Poem in American Literature" starting with Walt Whitman and continuing into contemporary works. When it came time to choose an individual research project, Prof. Pearce suggested that I look at Snyder's little known "epic" poem, Mountains and Rivers Without End. I was familiar with Snyder's Myths and Texts, a completed long poem, and many of his shorter lyrical poems, but I knew little about what the poet referred to as his ongoing project. I date my research and writing on Mountains and Rivers Without End to the time of my decision to write a paper for Dr. Pearce's NEH seminar. By the end of that summer, I was so hooked on both the mystique of the poem's wholeness (what it might look like when it was finally published) and on the meanings of various sections I had already seen that when it came time to submit a proposal for a sabbatical in the coming year, I outlined plans for further research on Snyder's developing poem of epic intent. My sabbatical request was granted and we took up residence in San Diego for a year where I was able to use the facilities of the University of California at San Diego's Archive for New Poetry. During that year I filled in a good many blanks and honed my research skills. 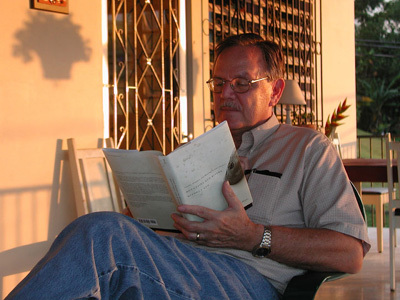 With the help of Michael Davidson of UC San Diego and Dan McLeod from San Diego State University I tracked down several poems that I suspected were going to be part of the final Mountains and Rivers Without End. What about the tradition of "the long poem"? What evidence of other 'long poems' do you see in Snyder's Mountains and Rivers Without End? How about Hart Crane's The Bridge? An intriguing question. With archetypal journeys and mythical structures, not to mention the evidence of Native American culture, present in both poems, there are obvious parallels to be noticed. Voyages of discovery and undergrounds visited, to name just two, come to mind instantly. Recently I noticed a reference that makes me think there may be more specific links between the two poets waiting to be explored. You may remember that one of the sections in Snyder's poem is "Walking the New York Bedrock." Given that Crane's vision begins with the Brooklyn Bridge, where better to look for a connection than in this section of Mountains and Rivers Without End. Indeed, I was startled to find a reference to an "Anemone" in the final lines of Crane's poem. Considering that Snyder also relies on the metaphor of an "anemone" in his New York poem, that his New York is viewed as if it were underwater while Atlantis, prominently mentioned in Crane's poem, is normally conceived of as an island swallowed by the sea, the link between the two poems begins to seem less conjectural, but I believe I'll leave the meanings for another critic to work out. Speaking of settings, at times your work seems as grounded in actual landscapes as it does in academic matters. Is there a reason for that? I hope that's true. For example, during that sabbatical year (1979-80), whenever we had long weekends or holidays my family and I explored some of the landscapes of the west that were depicted in Snyder's poems. We drove much of old Highway 99, roamed up and down California's coastline, crossed its central valley, walked about in the Sierra Nevada, and ranged as far as Arizona and New Mexico for a look at Canyon de Chelly and Chaco Canyon. All the time I was taking notes on published poems from Mountains and Rivers Without End and, like other Snyder aficionados, I was wondering if and when it would ever come into being as a whole entity. In the late 70s it seemed that Snyder would never actually finish the poem; in interviews he promised he would wrap it all up soon but hindsight tells us he was otherwise occupied by social and political concerns of the moment. Although I occasionally conjured up some vision or other of "the whole poem," I found myself giving less thought to that potential totality and concentrated on what I felt were significant sections, like "Bubbs Creek Haircut" and "The Hump-backed Flute Player," that seemed to stand on their own. At academic conferences I gave presentations on what I knew about Mountains and Rivers Without End, but only as reflected in the sections I knew. In the early 80s, I continued to think, albeit casually, about individual sections of the poem; there was certainly no thought of a book in my mind. During summer months when my family and I were in the states, I usually arranged our time so that we could hike and camp not too far from an academic library. In this way I could take research notes, say on Kokop'ele's wanderings, and then visit a site where we could search for the tangible petroglyph. My wife and I also made a trip north into British Columbia where I became more familiar with the landscapes and cultural artifacts of the tribal nations of the Pacific Northwest. Most significantly, we went to the White Mountains in California to hang out with the ancient Bristlecone pine trees, a marvelously inspiring place to be. So when did you begin to believe there might be a conclusion of sorts to your journey with Gary Snyder? Well, this interview itself is evidence that my journey with Snyder, like the poem itself, has a way of continuing, so I'm reluctant to speak of conclusions that are final; endings in Snyder's world seem more like pauses before the voyage, whatever voyage it might be, begins again. In 1986-87 I was granted a Fulbright Hays lectureship to teach American Literature at the University of Osijek in Yugoslavia (in present-day Croatia). While I was there, I was invited to give a talk on Snyder's work at the Univ. of Belgrade. Over a hundred people turned up for my presentation. Surprised by the number, which I took to be a marker of Gary's strong international reputation, I wrote to him about it and told him of my continuing interest in Mountains and Rivers. Thinking back on it now, I believe this was the first time I actually wrote to him about his poem. I was doubly surprised when he wrote back to tell me not only that he remembered me from his visit to Colby but that he was happy to know I was intrigued by his long poem which he had recently begun to work with again. He enclosed photocopies of Dôgen's Mountains and Waters sutra and several sections of Mountains and Rivers Without End that I had not seen before. The following summer I made an extended visit to the Shields Library at the University of California at Davis to examine Snyder's papers which by that time had been deposited in their Special Collections Room. All sorts of material—correspondence, draft copies, journal entries, to name a few categories—related to the development of the poem existed in the archive, much of it waiting to be catalogued and all of it begging to be explored. I took hordes of notes but it wasn't until the early 90s, as Snyder began to publish more sections of his poem in literary magazines, that I began to think in practical terms of writing a book about his long poem. When another sabbatical became possible I proposed to spend it at Davis as a way of concluding my research and writing on Snyder's poem, thinking that even if I wrote a critical "biography" of an unfinished poem, it would be a significant venture. My proposal was granted and my wife and I (the "children" were now adults, walking their own respective paths) spent 1993-94 in California. In the spring I had a chance to visit Kitkitdizze to speak with Gary about his poem; among other things, he assured me he was working full time to bring everything to a conclusion. As things turned out Mountains and Rivers Without End was published at the end of 1996. My own work seemed like it was beginning all over again; just before Snyder's poem was published in its final form many sections appeared that were new to me, which is not to say that they were newly written by the poet. It wasn't until January of 1998 that I concluded the first complete draft of my own work. There were revisions ahead of me and still another journey I had not anticipated. My manuscript was to spend several years going through the hands of various editors and publishers before it finally came to rest at the University of Nevada Press. I was wondering about the title of your book — was that your choice? I had two working titles; both seemed appropriately catchy and ripe with significance to me but neither made the final cut with the press. First there was Dimensions of a Poem: Gary Snyder's "Mountains and Rivers Without End." This title echoed both Snyder's Reed College thesis—He Who Hunted Birds in His Father's Village: The Dimensions of a Myth—an amazing piece of writing for a college senior, and the collection of essays edited by Jon Halper to commemorate Snyder's 60th birthday: Gary Snyder: Dimensions of a Life. I thought of my own book as a commemoration of Snyder's poetic life as embodied in his magnum opus, the poem that brought his early studies in mythology to fruition. My title also indicated, quite clearly, that my book would deal with certain parameters or "dimensions." While it might provide an overall glimpse of the poem's shape, it could only measure aspects of Snyder's poem and would not pretend to be the last word on the subject. There would always be undiscovered aspects, new dimensions, that might still be explored, and new tools to do the measuring. My second choice, one that I am still fond of, was Opening the Poem: Gary Snyder's "Mountains and Rivers Without End." I have retained an explanation of this phrase in the opening pages of my book. "Opening the poem" is a brief statement of how I view the act of literary criticism; it mimics the phrase pradakshina which is defined as the ritual practice of circumambulating a mountain. Why does one circumambulate a mountain? To pay respect to it; yet one acknowledges that one will never know the mountain completely and that the trip must be made again and again. So it is with literary criticism and with my book as an example of that; I do not hope to conclude anything, only to explore time and again and, in the exploration, to give respect to the poem and the poet. Mountains and Rivers Without End is a marvelous achievement; it deserves ongoing respect and attention. I didn't know that the press would have the final say about titles. When the editorial staff at Nevada felt that my first two choices did not indicate the specific academic content of my book, they asked for another along those lines; thus Genesis, Structure, and Meaning in Gary Snyder's "Mountains and Rivers Without End" was born. I don't have a problem with it as long as readers understand the creative nature implied by the word "genesis." I spent what seemed like years among the archives of several major libraries rummaging around in old letters and early manuscript versions of poems in order to get a sense of how Mountains and Rivers Without End had developed step by step. It wasn't just the "facts" I was after; there was the kick of being able to hold in my own hands the original pieces of paper on which this grand work of the imagination first came into being. Archives often contain data which appear as dry as statistical compilations, but even that data always represents a story to be told. Creativity (I don't mean fictionalizing) and truth intermingle at such junctures. Telling the story of how Mountains and Rivers Without End came into being, section by section, was a difficult job, one in which I needed to toe the line between the facts I gathered and what I felt was an exciting story of creativity, the making of a significant literary work. One of the great contributions of literary criticism, it seems to me, is to capture verbal creativity in the making. If "genesis" implies that, then I'm satisfied. And structure? What about the interweaving of microcosm and macrocosm that you spoke of earlier? Could you elaborate on that? Surely, especially since structure and meaning, the final two descriptive terms of my title, play off of one another. It's one thing for a reader to experience a work of literature deeply, to feel it grab one by the throat or quietly invade one's inner being in some sensuous manner. Some readers are easily "moved," often to tears or anger, even if it isn't a very well written piece of literature. It's another thing for the meaning of a literary work to linger in one's intellect, perhaps even to call the reader to action. Readers who "get the message" like to wrap up a poem, a story, a novel, in some thematic 25 words or less statement. It's been my observation that readers most often fall into these first two categories while persistently neglecting artistic craft, an appreciation of the way a work of art is created, how it is put together bit by bit, sometimes with conscious deliberation, sometimes instinctually. Art rarely just happens, although there are clearly schools of art that promote that position. Jack Kerouac's thoughts on "spontaneous prose" would apply here; so would much of what William Burroughs described as literary creation. I think of Jackson Pollack's action painting too. In the theatrical world there was a time for "happenings" (it didn't last long). Zen inspired works might also be seen as an example here, but one has to keep in mind that the Zen artist is often engaged in endless repetitive acts in order to achieve that one moment of intuitive perfection. Personally speaking, I believe the best works of art combine all of these factors—feeling, message, craft—but my preference is to begin with what defines a work of art as art, its craftedness. I like to spot the design. In the case of Gary Snyder's Mountains and Rivers Without End, long before I knew anything about Buddhist thought, I was intrigued by the sequencing of his poem. I wanted to figure out how each "section" fell into place within the macrocosm of the longer poem. In fact I set out to prove that there IS an order, a craft, to be seen in the way Snyder has presented the sections within the larger poem. The thesis of my book is exactly that: that Mountains and Rivers Without End is not a random compiling of 39 separate sections, but a carefully worked out sequencing of those sections. Moreover, an individual section—in its stanzas, lines, rhythms, images, themes—also shows the hand of the artist at work and a good reading of a section will spot the design in each one. I shouldn't overstate the case; things don't always click into place as if they were part of a smoothly oiled machine. There are times when one senses that Snyder has presented things as they are, because "they are." Still, there is plenty of evidence of craft and design, plenty of pure delight awaiting the reader who suddenly resolves the mental puzzle of how a section, a line, an image, an idea, interconnects with another. After all, the Buddhist principle of "interconnectedness" is at the heart of Snyder's poem; all things are dynamically interpenetrating. In my estimation, the best way to experience the artistic quality of Snyder's masterpiece is to understand, in the fullest sense of that word, the process of interconnection. That's what I mean by interweaving microcosm and macrocosm. The meaning, such as it is, resides in the structure. Beyond the world of literary criticism, did you have larger goals in mind as you wrote your book? To paraphrase from my own book, as a university teacher (for over 30 years) I struggled to bring meaningful texts into close proximity with what I hoped were inquisitive minds, hoping to allow those minds to envision more to life than video games and fast-food restaurants. I don't care much for the evening news either, although I have to admit that news can be an important part of life. Snyder's world view as expressed in his poems and essays was illuminating for me personally, so I found a certain amount of joy in sharing that gleam of intelligence and feeling with a larger audience, first by means of presentations and written articles, and finally in the form of a published book. Still, I never saw my book as an encyclopedic "Reader's Guide" to Mountains and Rivers Without End, merely a key to allusive words, phrases, or meanings that turn up in Snyder's poem. That kind of book would smack too much of pure academia, a stultifying experience rather than a dynamic one, hardly the poetic experience I wanted to convey. So I struggled to keep my text readable, not a compendium of critical references and poetic theory for professional academics, but a book that might be read by all sorts of interested parties. In my view, Snyder's long poem should be required reading for any one concerned about the dynamics of our planet. It would be nice, of course, if all those who read Snyder's poem would turn to my book to assist them in their reading, but I don't wish to rob readers of the illuminating joy of personal discovery. As the poet Rumi says: "There are hundreds of ways to kneel and kiss the ground" (trans. Coleman Barks, The Essential Rumi 1995) Nevertheless, I hope readers of my book will come away with a greater appreciation of Snyder's wisdom and poetic artistry. I hope it will help them to succumb to the magic of reading long poems, especially one entitled Mountains and Rivers Without End. 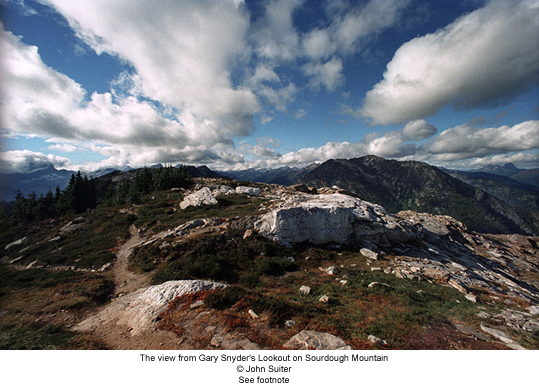 The first picture is the view from Gary Snyder's Lookout on Sourdough Mountain, © John Suiter, All Rights Reserved. From the book, Poets on the Peaks. For more images from the book, visit www.poetsonthepeaks.com and read Michael Rothenberg's interview with John Suiter in Big Bridge No. 8.